All’s Faire in Middle School is a heartwarming graphic novel about starting middle school and navigating the challenging worlds of friends and family. We learn that the rules of middle school are even more complex than the rules of swordplay, and that we all have a dragon inside of us that we can choose to overcome. Read this book so many times love it. I have never read a book about a renaissance fair and i loved it! This book was a good book, I enjoyed how the author showed how the main character, Imogene perspectives affected the story. All’s Faire in middle school was a great book about a girl who got bullied by a girl named mikkia and fights her way throw middle school. All’s Fair in Middle School is a great book. It is about a girl named Impy who starts middle school. It takes place at a renaissance fair and is about how she gets bullied by Mikka. 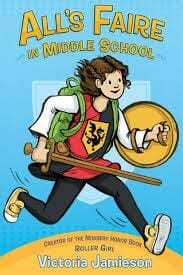 All’s Faire in Middle School is a graphic novel about Imogene, a girl who had been home-schooled her whole life until this year. She is going into her first year of middle school. It is a funny and interesting book about her perspective on bullies, mean teachers, boys and much more.